When it comes to choosing travel destinations, I never have a shortage of methods on how to decide where I go next. There are places I’ve dreamed about forever, places inspired by history or wonder, places I’ve heard about from other travelers, places to see before they’re gone, places that are currently the most-affordable, or sometimes I simply see a photograph and immediately say “I need to go there one day.” Thanks to this photograph, Patagonia became one of of those places for me. Planning a visit began the instant I found out that the destination was also at the top of Anne’s travel list. One of the biggest changes I’ve had in my travel planning in the last couple of years is that I try to visit places that aren’t prone to over-tourism and or use tour operators that cause avoidable damage to the environment. 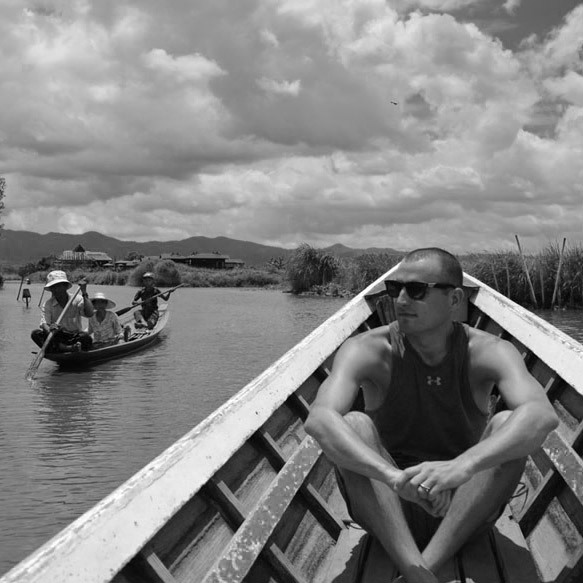 I definitely don’t claim to be an expert in ecotourism or sustainable travel, but I do try my best to spend my tourism dollars with companies dedicated to protecting their local environment, employing the local population, and investing in ensuring future generations will also be able to experience the same great travel destinations that we have been able to. 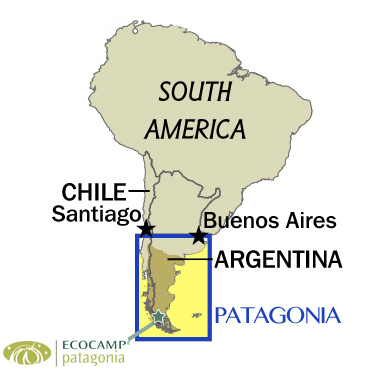 It is how we have ended up booking a week at a place called EcoCamp in Chilean Patagonia. 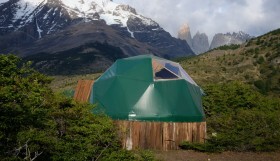 EcoCamp is a fully sustainable, domed-accommodation located on a ridge over-looking Torres del Paine National Park. I am writing a separate article later this week that talks more about what EcoCamp is all about and why they are considered to be one of the tourism industry’s leaders when it comes to sustainable tourism and innovation. For now, let’s talk about the last 24 hours in Santiago! One of the reasons Patagonia, specifically Torres del Paine National Park, only gets around 150,000 visitors each year is because of its isolated location. 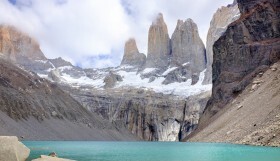 Near the very bottom of South America, Torres del Paine is actually closer to Antartica than it is Santiago, the Chilean capital city which Anne and I will be stopping at for a quick 24-hour layover. When it is all said and done, our journey from Minnesota to Patagonia will take about 45 hours! You’ll never hear me complain about a 24-hour layover anywhere. In my experience, 24 hours is always the perfect layover time for someone who wants to quickly check out a new city. While not enough time to really see all a city has to offer, it is just short enough where I can stay energized and basically run on fumes for an entire day. I can’t think of any 24-hour layovers in my past that I don’t have great memories of. I enjoy everything these short layovers bring to a travel experience. 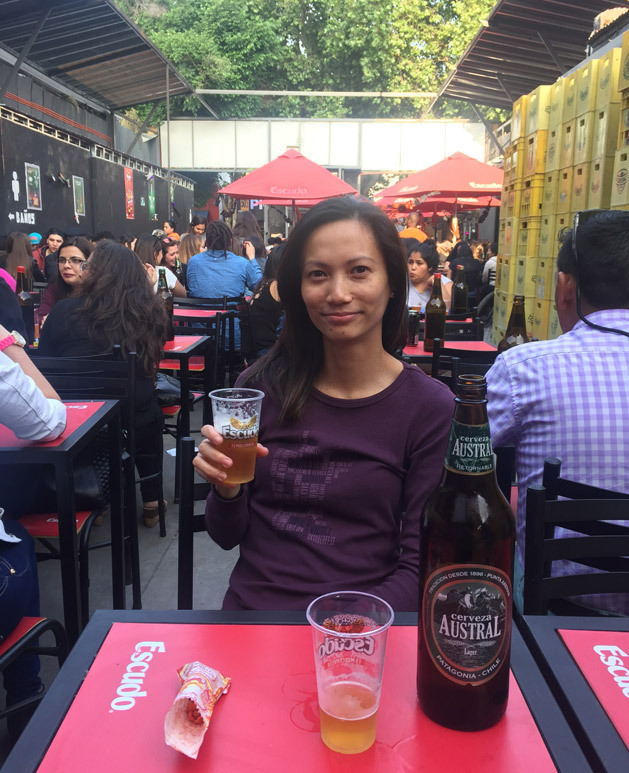 From the challenge the limited time poses to planning to the pressure to pick what to eat for each of that days meals, Santiago was another great city to spend 24 hours in. We’ve arrived in the early morning here in Santiago, fresh off of a 13-hour overnight flight from Atlanta. This is Anne’s first time in South America and my first time in Chile, so our excitement of being here has given us enough adrenaline to keep us from feeling any jet lag or fatigue. Our hotel is in the heart of Santiago’s Barrio Lastarria, and since today is Friday, our first walk through the neighborhood has given us a good sense of what the city looks and feels like during business hours. There is a mix of locals going about their day as well as tourists out enjoying the start of the weekend. 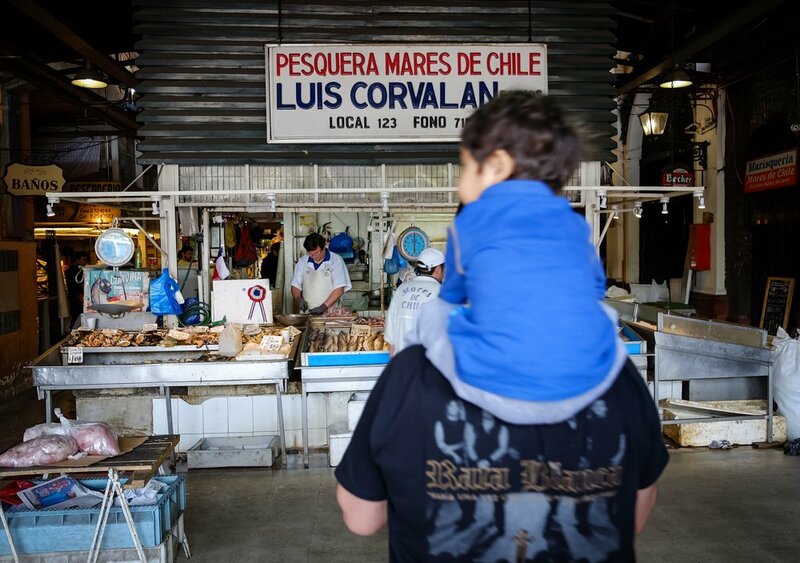 For lunch, we’ve headed to Santiago’s Mercado Central, the city’s historic fish market turned tourist attraction. My expectations aren’t very high for the market, as usually these “here’s where the locals hang out” places tend to be 95 percent tourists, 4 percent persistent salespeople and 1 percent locals. 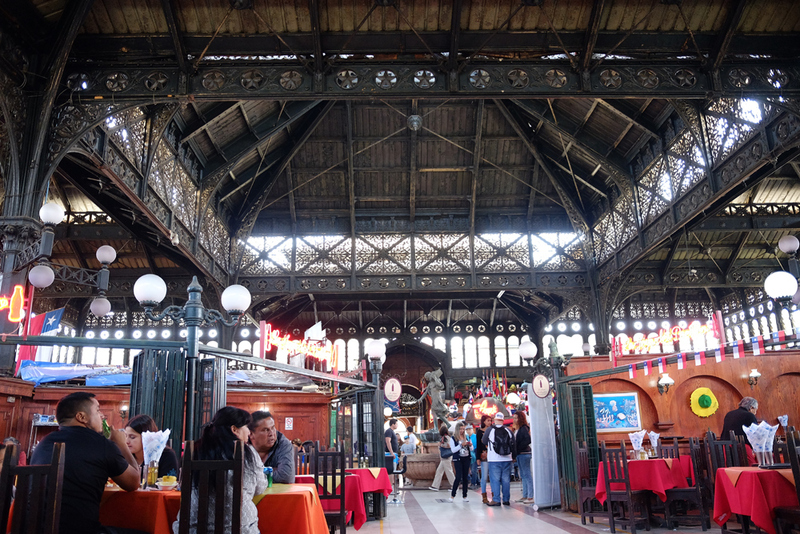 However Mercado Central first opened way back in 1872 and I am a history fanatic. 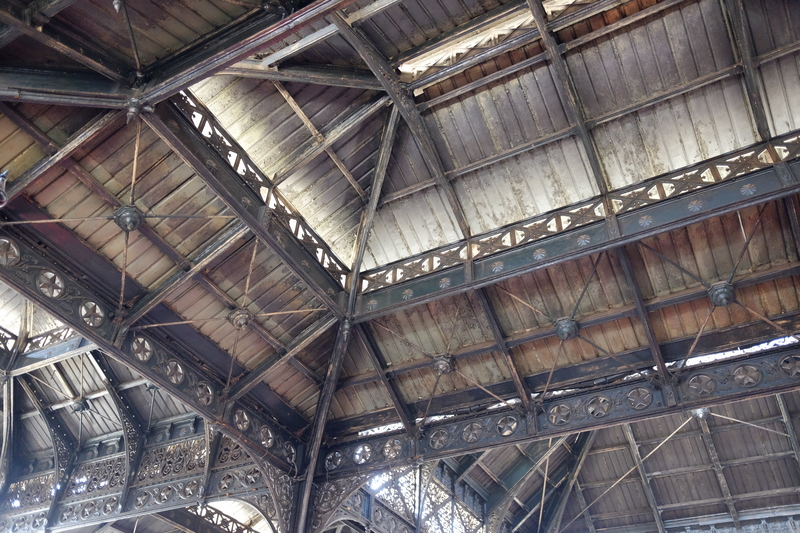 So while I am excited to sample some of the fresh seafood for lunch, I find myself more excited to see the inside of the market’s original roof. 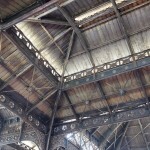 The cast-iron roof was masterfully constructed in Great Britain, and shipped piece-by-piece to Santiago for installation. Roofs just aren’t made with this sort of detail anymore, and walking in the main hall of the market is tough for me since I find myself looking up most of the time. Looking up also helps to avoid the constant pestering from each restaurant owner trying to get you to eat in their restaurant. Instead of eating in the main hall, we’ve walked down a few of the side aisles to find a quieter lunch spot. As we get further away from the market center, the size of the English vocabulary of each potential waiter slowly shrinks. By the time we find a good stall to eat, I have become completely reliant on Anne’s Spanish knowledge to order for both of us. 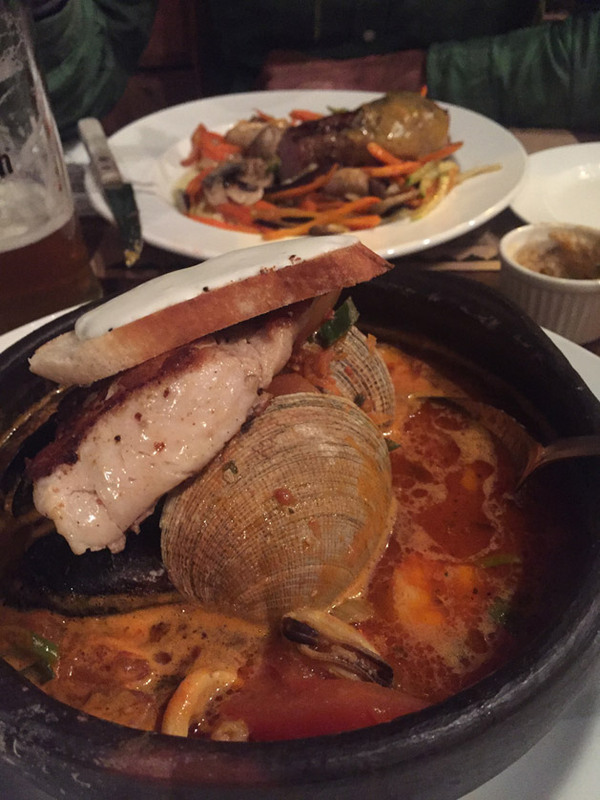 She doesn’t disappoint as we soon have a full table of beer, bread, and fresh fish. After lunch, we make the journey on foot to the base of Santiago’s San Cristóbal Hill. The highest point near the city center, the hill features panoramic views of the city and is easily accessed by cable car. 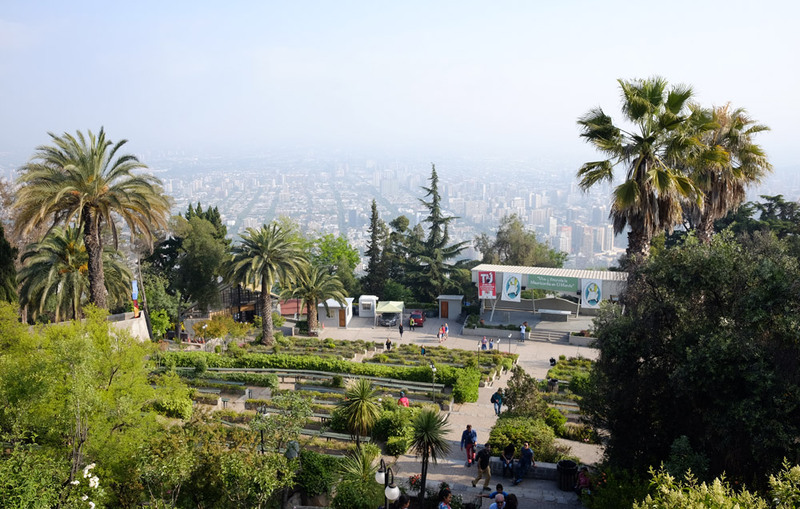 There is a way to hike up the hill on foot, but with only 24 hours of time in Santiago, we have to opt for the quick and lazy version of getting to the top and back. 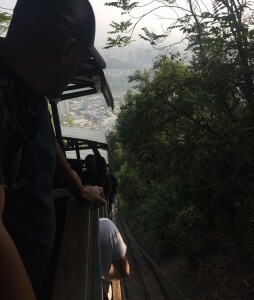 The cable car it is! 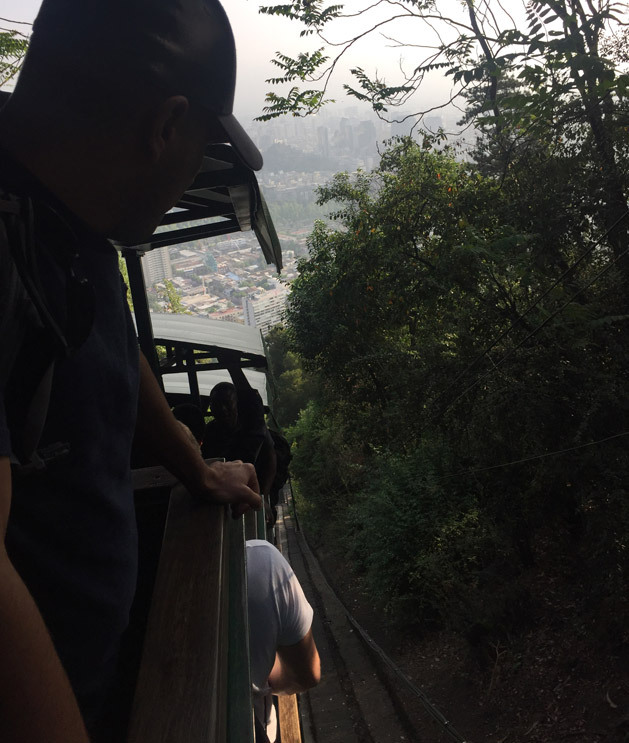 Thanks to a city-wide strike of public workers, the cable car has been closed for the entire morning. Our arrival in the afternoon just happened to line up with the re-opening of the cable car service. This allows us to get right up to the top without having to wait in any line at all. Our luck seems to have run out as we reach the top. A ‘probably toxic’ mix of Los Angeles-style haze/smog/fog is much more apparent up here and has limited the view to only about half of the city. The trip isn’t a total bust though, as the sanctuary and gardens up here are really spectacular. There isn’t any sort of service going on today, but it is easy to imagine the beauty and spirituality that would come from having a full mass with the city as a backdrop. The descent back down to the city has taken just long enough for us to realize that it’s not only Friday, but it’s happy hour. We’re in Santiago’s Barrio Bellavista, and the transformation that occurred in the short time we’ve been away has been striking. Two hours ago, the streets were quiet and mostly empty, but now we’ve found ourselves descending on a swarm of both university students and professionals starting their weekends off with drinks and friends. Both sides of the street are lined with pub tables with umbrellas, and not a single one is empty. The bars are narrow, patio-like atmospheres that are walled off from the street by colorful iron fences. Each one seems to stretch further then the next, and since they all seem to be identical, we finally settle on one called Zona 3. This place is packed, and it immediately transports me back to some of my favorite college dive bars. One wall of the bar is made completely out of yellow crates, holding the hundreds of one-liter beer bottles. This is the sort of architecture worth flying 7,000 miles to see! One visit to the men’s bathroom and glimpse of the Wisconsin-style piss wall is all it takes for me to feel right at home. Who needs urinals when you can simply have men pee on a periodically water-sprayed wall? This is my sort of bar, and just when I think it can’t get any better, I find a man selling spicy peanuts on my way back to the table. After a couple rounds of beer, the greasy trays of food that have been passing by our heads begin to look more and more appetizing. Make no mistake about it, this is not some sort of delicacy or must-eat food when coming to Santiago. 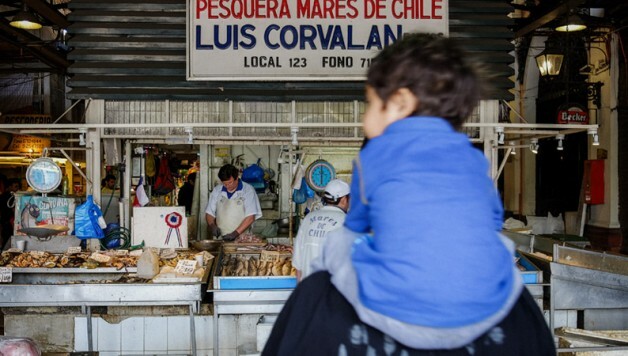 It is probably deep-fried in oil that hasn’t been cleaned since Chile’s 1973 coup d’état. There’s no menu, so we decide to just ask the server to bring us whatever he feels like. 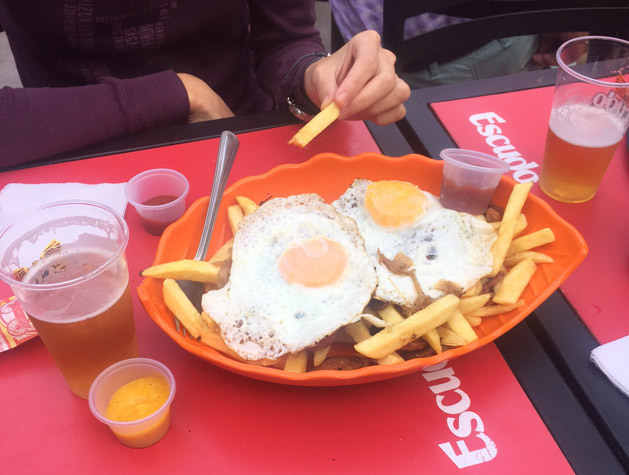 The result is a bowl of french fries and meat, covered by two fried eggs. The dish is served in an orange, leaf-shaped bowl that looks like something my Aunt Dottie would serve her Christmas chocolates in. The greasy bar app served its purpose and held us over until our late dinner. 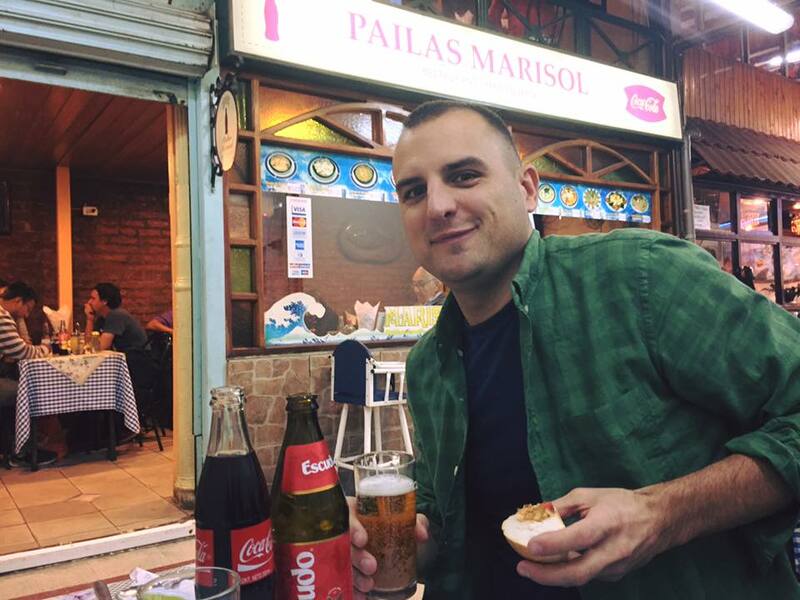 After another couple of hours of walking around the city, we’ve taken a quick break back at the hotel and have now headed off to back to Barrio Lastarria to find something a bit nicer than fried eggs and chips for dinner. We only get one dinner here in Santiago, so we’re trying to make it count. We’ve settled on a place on the main street in Lastarria called Sur Patagónico. It’s a small restaurant, and although it’s full, coming at 9:00pm has made our wait time for a table only 15 minutes. Walking to our table, it is obvious we picked the right place, as the walls are covered all the way to the ceiling with bottles of wine. We’ve ordered some seafood stew and wild boar as well as some Chilean wine and beers. I’m not a foodie, but both dishes were awesome, and this has been a great way to end our one day in Chile’s capital. 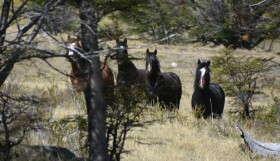 Tomorrow, we’re off to Patagonia! Ecotourism is a great idea, Dan. 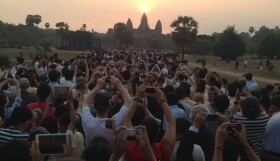 Ecotourism ensures that the fame of a destination does not destroy it.